When I first stopped into this bar in July 2009, I wrote here how boring it was. It seemed like the lifeless remnant of some 70s fern bar, with no distinct features, hardly anyone in the place, and a virtually lifeless bartender. Like many people, I assume it was the "Lake City Bar and Grill," as the signs outside proclaimed, and I assumed I'd never be back. 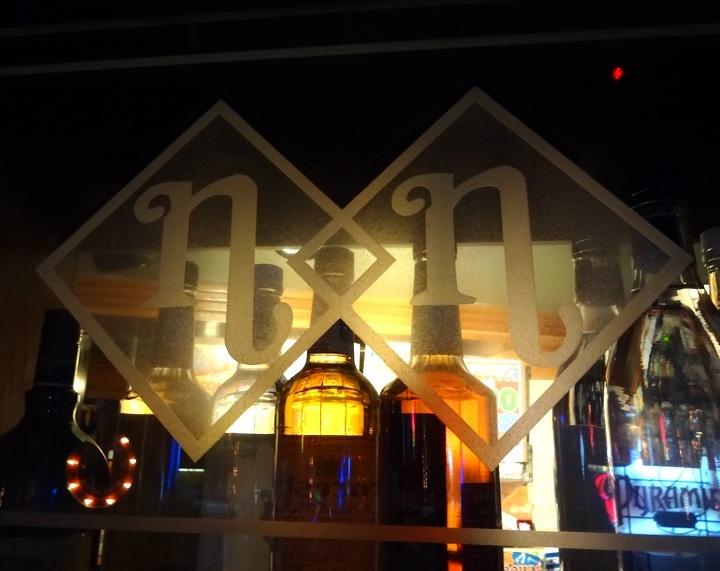 Hanging bar above the main bar bears vestiges of Neal's Nightcap. 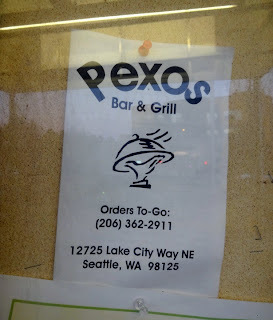 What brought me back in Sep. 2012, was finding the unfamiliar name of Pexos Sports Bar. 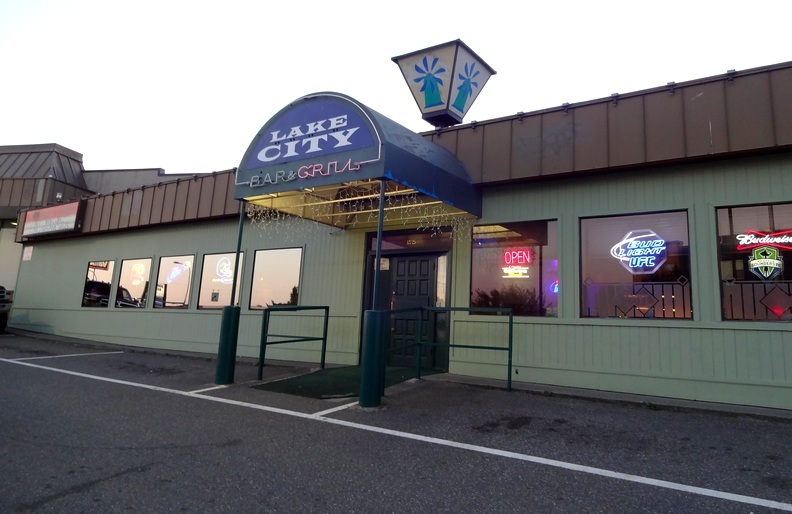 It turned out that Pexos is what many people call the Lake City Bar and Grill, as the investment of a new sign was apparently considered frivolous. I was glad I came back though -- the place was a bit more lively, there were more interesting characters, and I did a tiny bit better job at noticing various vestiges of the past. That past was then partially filled in by long-time resident and customer Ashley. This clip art flyer beside the door was the only hint I saw of the "Pexos" name. Ashley informed me that the place was previously Neal's Nightcap (hence the "N N" etched in the hanging bar), and earlier the Green Mill (odd, because there is a sign with a blue mill still on top of the building), and possibly also The Lantern (presuming she is not conflating this with the Beacon Light Tavern which used to be on the next block). It also went by various versions of "O'Neill's up until 2005 or so (O'Neill's Family Restaurant, O'Neill's Pub and Eatery, O'Neill's Restaurant and Bar). Unfortunately, it is difficult to find primary records of establishments this far from the downtown area. Previous bars in this location: O'Neill's, Neal's Nightcap, The Green Mill? The Lantern?